The Jimi system (Chinese: 羁縻制) or Jimifuzhou (羁縻府州) was an autonomous administrative and political organization system used in China between the 7th century and 10th century. It should not to be confused with the tributary system- which dealt with independent but deferential states. Jimi administrative divisions were used primarily during the high point of the Tang dynasty from the 650s until the 740s. The system was a model of Chinese administrative units established for foreign rulers or chiefs that were either militarily subdued or self-subdued and naturalized. Most of these regions existed on the outlying frontiers of the Chinese polity- and most of these local rulers also simultaneously served as Chinese governors. 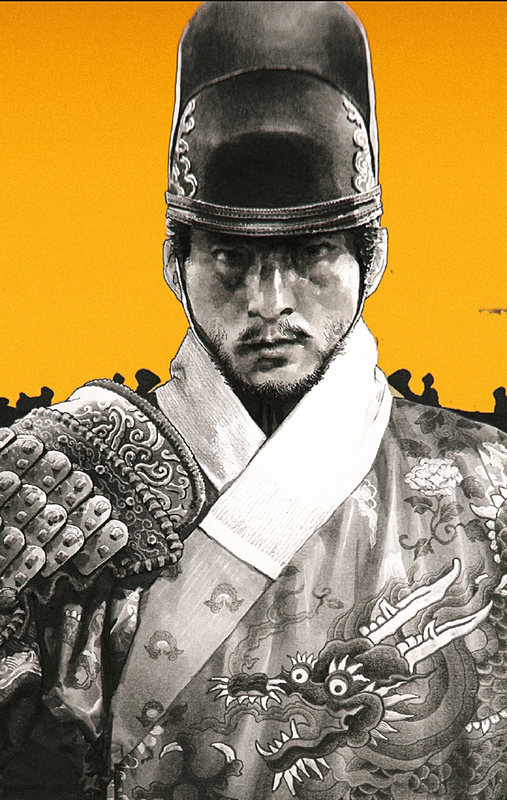 Throughout the history of the Jimi system it was imperative that the local strongmen have their interests aligned with the interests of the empire. Because they were often the only administrative and judicial force in the local area. The central government usually confered a high degree of autonomy for these governor- Kings. The Chinese Emperors of the Qin and Han dynasties had always received tributes from many outlying neighbor states (Tributary System.) 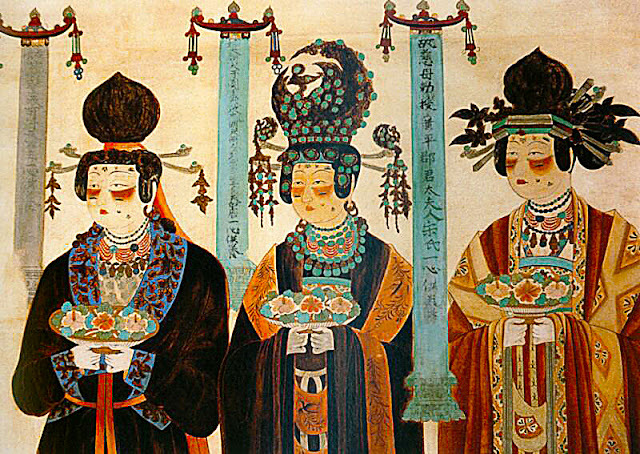 During 400 years of Han Dynasty rule, the central court would usually reward local allies with titles to act as local 王 "Kings," 侯 "Lords," and 长 "Chieftans," The imperial court would also cultivate favors by rewarding allied warlords with imperial daughters through marriage, gifts, and declarations of imperial protection. 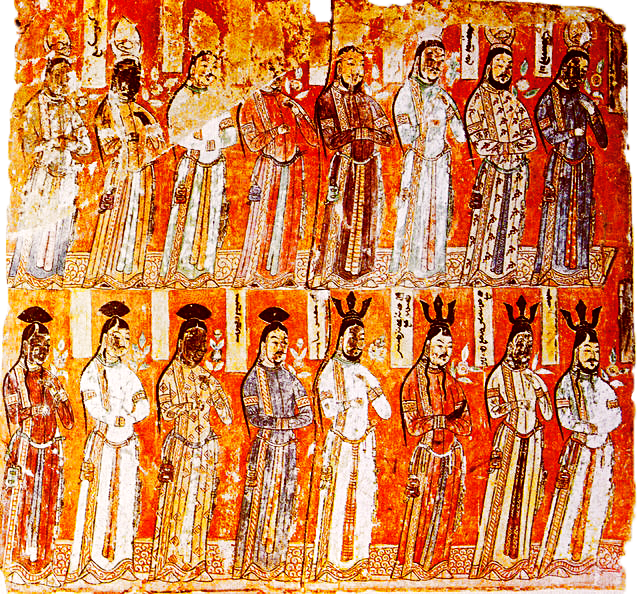 During the Han, many Kings of the Tarim Basin also served as Han dynasty officials while the Han dominated the western regions. 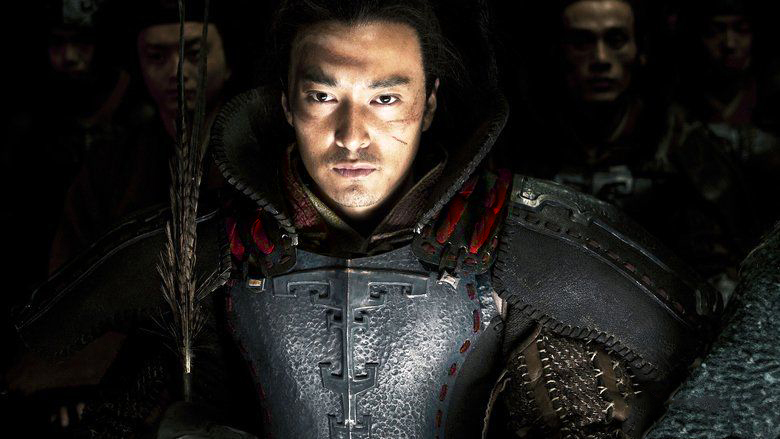 But when the Han realm collapsed into anarchy during the chaotic wars of the Three Kingdoms- and the 3 centuries of political fragmentation that followed, the smaller states from around China faced a strange new dilemma. What happens when at any given time there's always SEVERAL (rather than just ONE) ruler who claim to be the sole "Son of Heaven?" 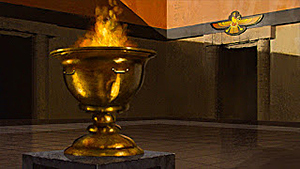 During the 3 centuries of fragmentation that followed, there were often multiple political powers claiming that they were the masters of the world and demanded tribute from their neighboring states. Local powers like Queen Himiko's Yamatai pledged their tributes to Cao Wei, while the Yue states in the south pledged their tributes directly to the kingdom of Wu. To receive Chinese luxuries and important Chinese made supplies, small states often paid tributes to several Chinese states at once to get what they needed. Some medium sized states such as Kofun Japan and various Korean Kingdoms also acted as middlemen that coordinated local tributary traffic from smaller states nearby and then contributed their own sums to the Chinese courts. 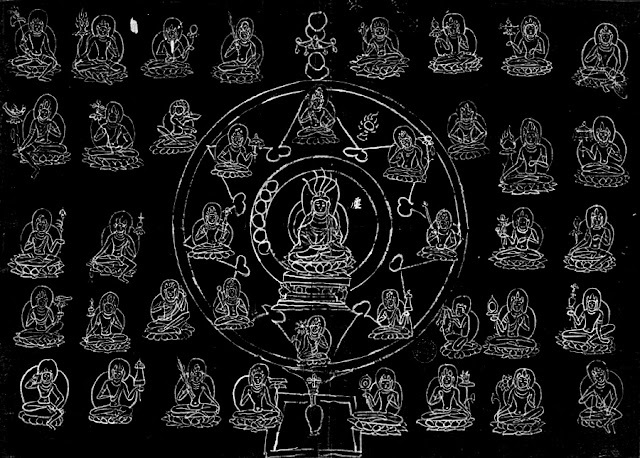 The tributary system of this period thus became a multi-dimensional network. On a military level, the relations of China and the outlying states also took on a more direct level. 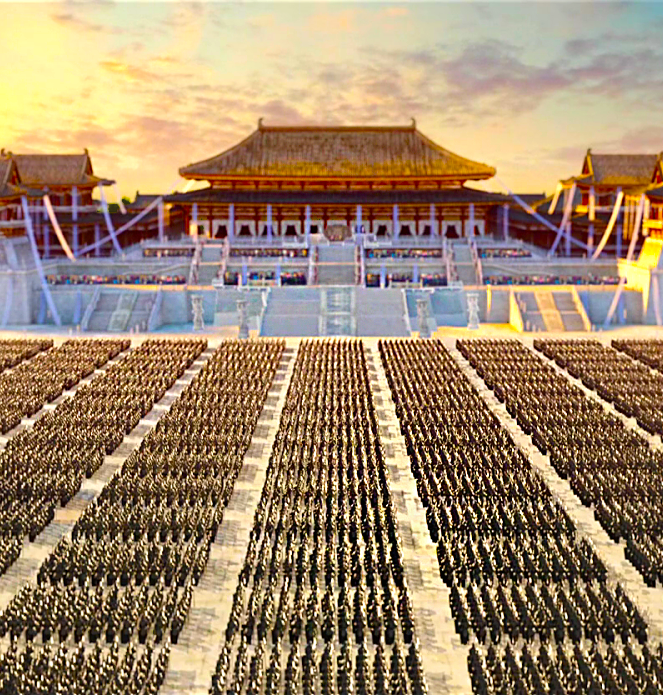 Throughout the constant cycles of war and peace between China and the various northern steppe polities, instead of conferring the traditional titles for the local strongmen to be 王 "Kings," or 侯 "Lords," the northern Chinese courts began to issue titles of imperial offices (rather than feudal offices) that were identical to the offices at court. 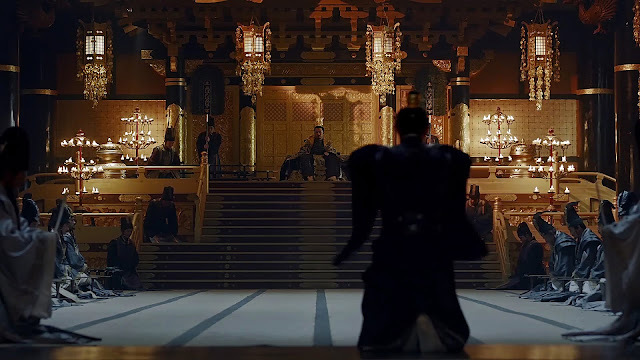 Kings of the Korean Kingdom of Baekje were offered the title of "General," and the various Kings and magnates of the Tarim Basin who were incorporated in to the Tang realm were given the title of "Governors." Thus a new caste of local rulers/ client governors were born. 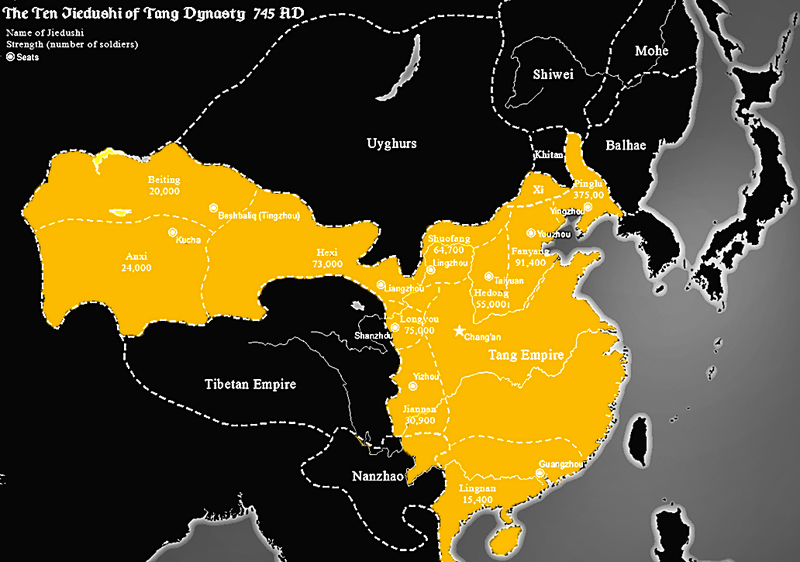 The Tang Empire at its greatest extent from 648-672. 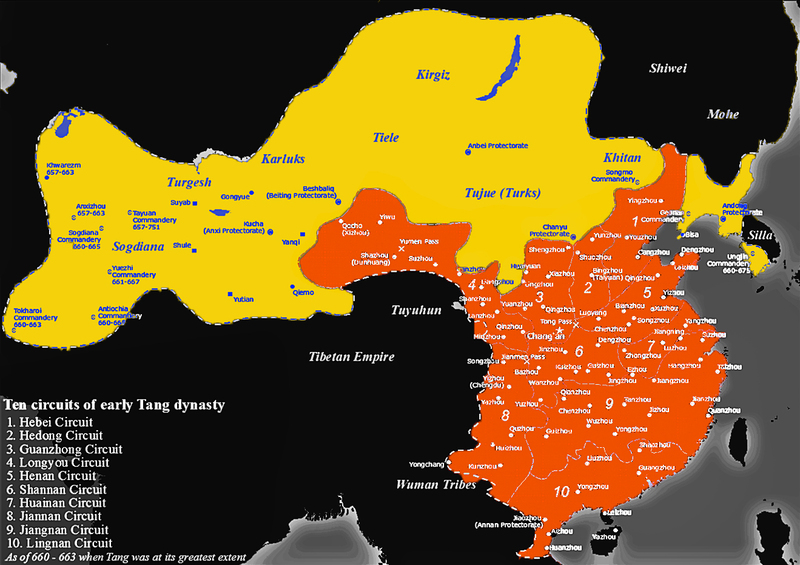 Orange represented provinces directly ruled by the centralized imperial court where as yellow represented the various protectorates and frontier military prefectures on the empire's frontiers. It is in these areas where many vassals of the displaced Gokturk Khaganate remained, that the Tang delegated them autonomy to both preserve their traditional titles as Kings and magnates while they also served as Tang governors. The Li clan of the fief of Tang were originally military governors on the northern front of their Sui overlords. 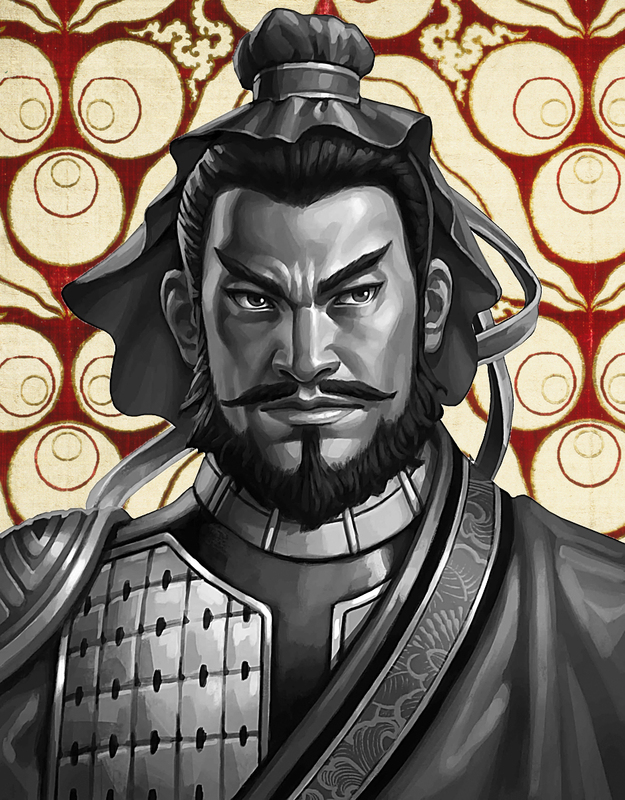 After enduring two decades of disastrous rule by the inept Emperor Yang of Sui, the Tang rose up and displaced the crumbling Sui dynasty. 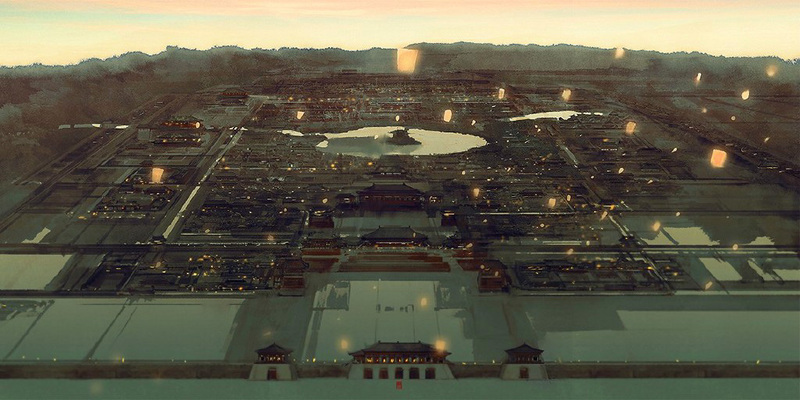 After it seized supremacy in all of the former Sui territories, the Tang would turn their attention outside of the former Sui realm. Throughout the next two decades the Tang would expand vigorously in all directions, they would destroy the then great powers of Central and Eastern Asia, the Eastern and Western Gokturk Khaganates and nearly triple the size of the realm by the end of their conquest. With these sudden conquests, also came new vassals and responsibilities. The Tang dynasty administered territory using a hierarchical system of three descending divisions: circuit dào (道), prefecture zhōu (州), and county xiàn (縣). Prefectures have been called jùn 郡 as well as zhōu 州 interchangeably throughout history, leading to cases of confusion, but in reality their political status were the same. The prefectures were furthered classified as either Upper Prefectures (shàngzhōu 上州), Middle Prefectures (zhōngzhōu 中州), or Lower Prectures (xiàzhōu 下州) depending on population. 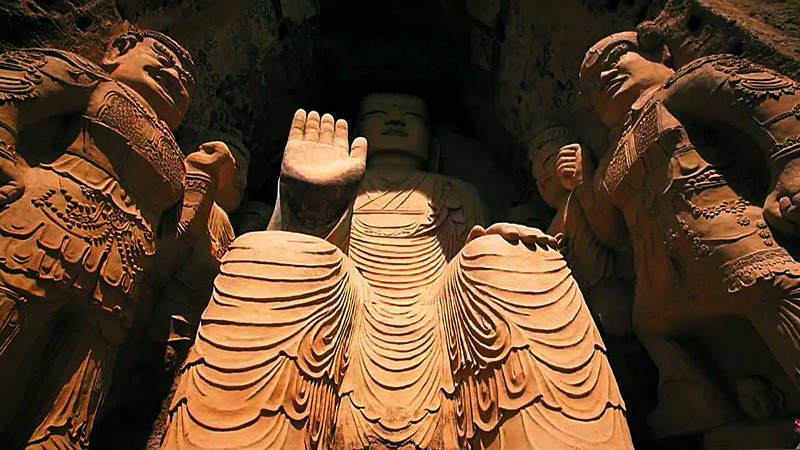 By the Tang dynasty, northern China was an estuary of many religions- especially "western religions," some of the biggest ones in the western regions included Buddhism, Zoroastrianism, and a sizable contingent of Manicheans. An Upper Prefecture consisted of 40, 000 households and above, a Middle Precture 20, 000 households and above, and a Lower Prefecture anything below 20, 000 households. Some prefectures were further categorized as bulwark prefectures, grand prefectures, renowned prefectures, or key prefectures for strategic purposes.  A superior prefecture was called a fu (府). The system was first introduced by one of the most prominent Tang veterans Li Daliang between August 23 and September 25, 630. 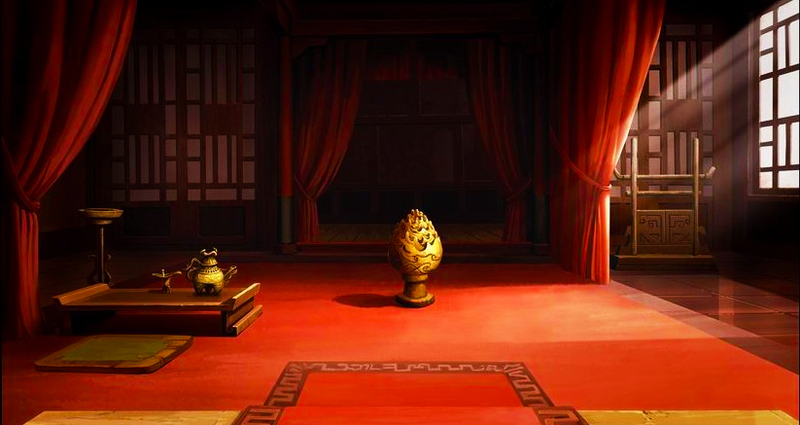 During this period the energetic Taizong Emperor of Tang quickly subdued a series of Gokturk allies and vassals, but because he preferred indirect, native feudal rule, he sought to preserve the local institutions while still incorporating them into fold of the imperial court. They were established in the area of today's northern Hebei, northern Shaanxi, Gansu, Ningxia, Inner Mongolia, Outer Mongolia, Siberia, Sogdiana and Afghanistan to the north and west, Hunan and Guangxi to the south, western Sichuan, Guizhou and Yunnan to the southwest, where they co-existed with the regular prefecture, and also parts of Inner and Central Asia. Until 755, there were approximately 1,000 loose-control prefectures in the empire. Most of these titles were allocated to the frontiers of northern China. It mainly consisted of three levels: the command area (都督府), prefecture (州) and county (县). Known collectively as Jimifuzhou or the "Loose-Control Administrative Units," they were not commonly confused with Zhengzhou (正州) or the "Regular Administrative Units" within the empire. In additions, there were also two Loose-Control Protectorates (duhufu 都护府) established in the former Western Turkic Khaganate at around the Tarbagatai Mountains and Lake Balkhash in 658, these represented the legacy of the Taizong Emperor's soft rule over these territories and these were the only loose-control protectorates ever established. They would hold on to whatever status they possessed as local rulers. 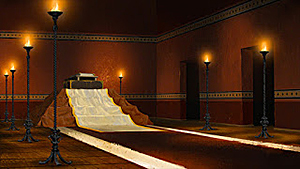 They received additional duties from central authority while keeping their original status, and would passed on their title and duties to their heirs according to local law. With the great sand sea of the Taklamakan desert at its center, and the ring of shield- like mountains surrounding it on four sides, human settlements could only emerge from the sparse oases dotting the region. With time, each of these oasis erected its own walled city-state headed by a local king who simultaneously acted as a governor of the Tang. For most, they were required to provide annual tribute and in turn received support and privileges from the imperial court. They were expected to following the foreign diplomacy superintend by the central authority. If the empire went to war, they would collaborate with the officials sent by the central authority in administration and provide an amount of local auxillieries. In judicial affairs, they would maintain their traditional local systems. However on matters in regards to interstate affairs, they were relied on to cooperate with extradition of criminals and eradication of outlawdry. 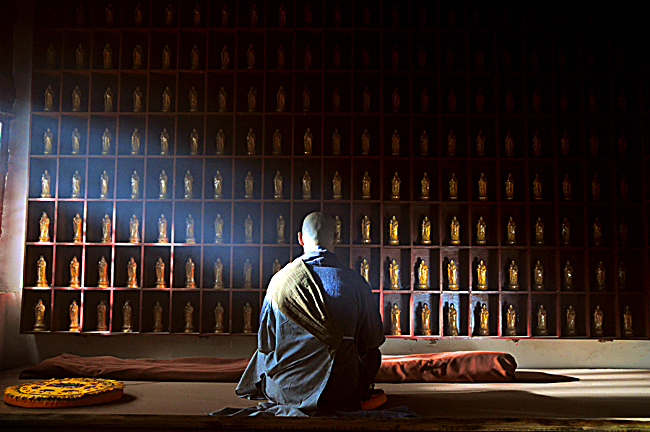 in the region with the displacement of Buddhism. 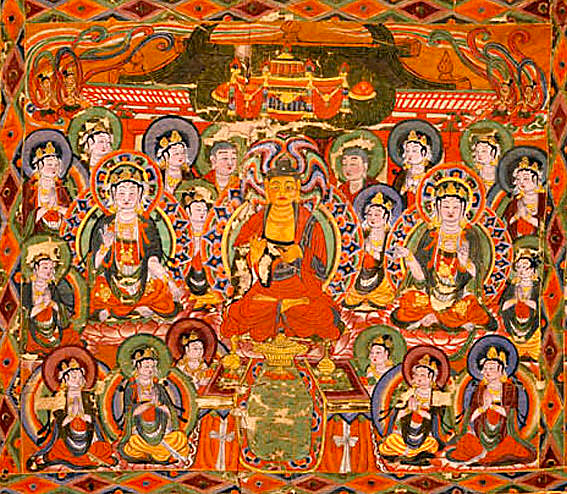 An assembly of various Uyghur Princes and chieftains. 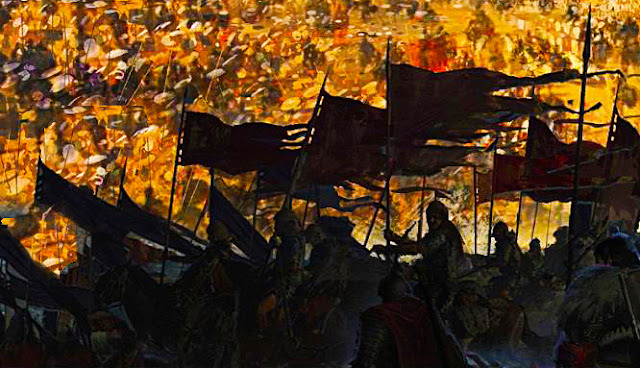 The Uyghurs were initially a minor tribe within the Rouran Khaganate, when the Gokturk Khaganate toppled the Rourans they became the bannermen of the Gokturks. 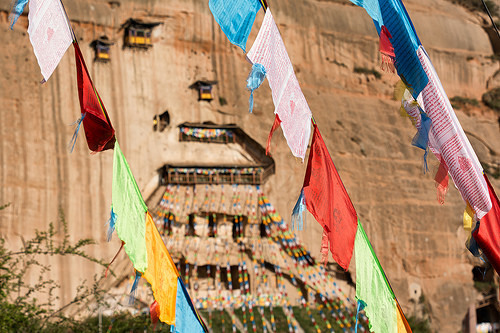 They were once only relegated to a valley that had 1,000 households. During the Gokturk Civil War and the ensuing 2 decades of chaos on the steppes, the Uyghurs sought an alliance with the rising Tang. After the establishment of the Tang they became allies of the Tang. Throughout the majority of the Tang dynasty and the Uyghur Khaganate the two state enjoyed a great deal of trust with each other as allies. 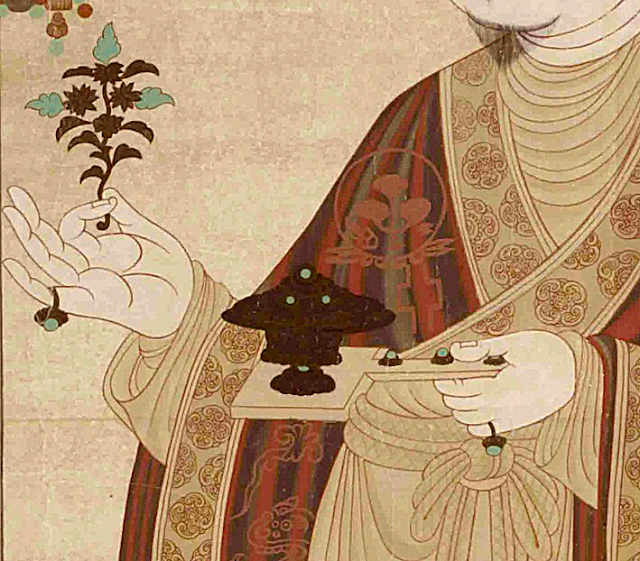 Portrait of an elder Uyghur Khagan, the Khaganate reached its zenith under the guidance of the Bayanchur Khan~ known for his wisdom. 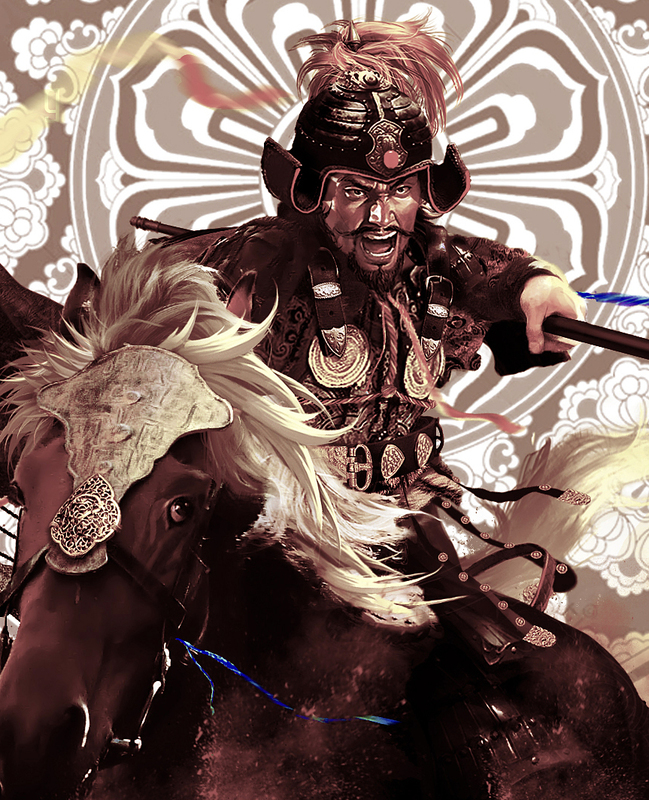 In October 756 Bayanchur Khan came to Tang China to rescue Tang Dynasty from collapse during the An Lushan Rebellion and to quell the rebels. 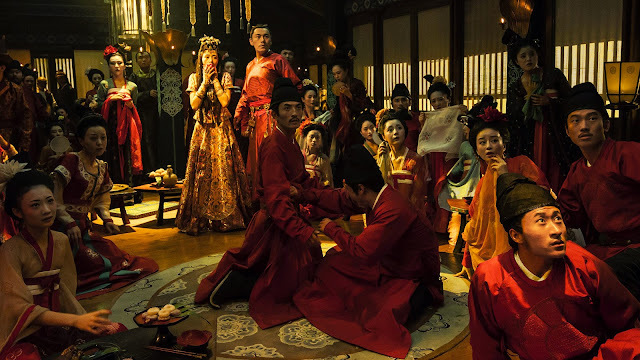 This military expedition was preceded by the Treaty of Peace and Alliance enacted with the newly ascended Emperor Suzong of Tang, who took a Uyghur princess in marriage while Bayanchur himself was given a Chinese princess, Ninguo, as his bride. In December 756 Bayanchur combined 4,000 of his selected cavalry with Tang forces and launched military operations against the rebels. These operations were successful and in 757 the joint forces liberated the Tang Dynasty capital Chang'An from rebel control. Aside from these common examples, the titles were also conferred to local rulers that had drastically more local autonomy than the governor- Kings and were more like fully independent client allies rather than the empire's governors. These 藩属国 "Vassal States" - though fully independent, would often pursue interests "On Behalf of the Emperor" or "As a representative of the Emperor" to receive benefits from the Tang court. These level of titles were conferred to several Kings of the Tarim Basin, to the various chieftains of Zhao (Nanzhao after their unification), the Uyghur Khagan, and sometimes the unruly Khitan Khagans. These vassal states also usually contributed auxiliaries for Tang's campaigns. As Tang China faltered in the middle of the 8th century, Tibet ramped up its efforts dislodge the Tang holds in the western regions by throttling the thin Gansu Corridor, in total, hundreds of battles were fought between a weakened Tang and the Tibetan Empire until both empires eventually imploded into anarchy by the 10th century. Padmasambhava Statue from the Johkan Temple, first built in the 7th century. 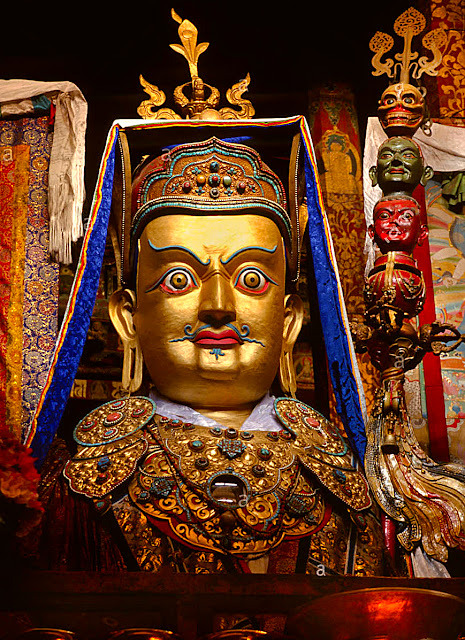 Under strong Tibetan Emperors (Chosgyal) such as Songtsen Gampo, Trisong Detsen, and Ralpacan, Tibet became a supreme regional power by the advent of 7-9th century. 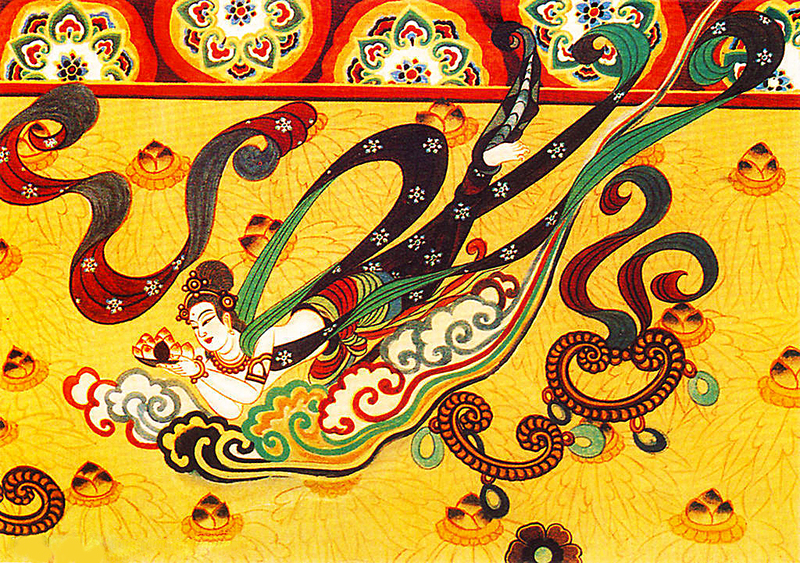 Just like the Gokturks from the earlier part of Tang history, the Tibetan Empire would become one of the mortal nemesis of the Tang Empire during the latter part of its existence. 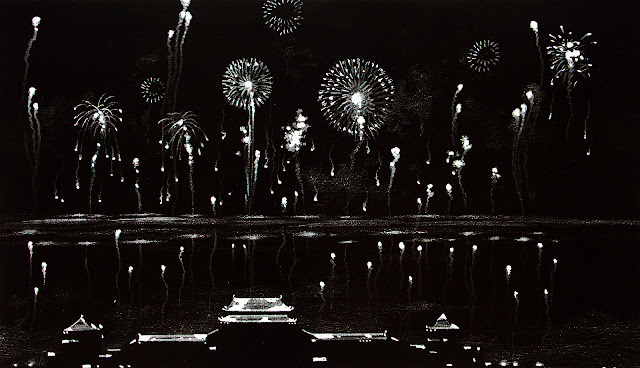 However, it would suddenly implode in 842 when its last Emperor was assassinated by a Buddhist fanatic. Throughout the 800s, the Tang would frequently ally with the Uighur Kaganate against the Tibetan armies. 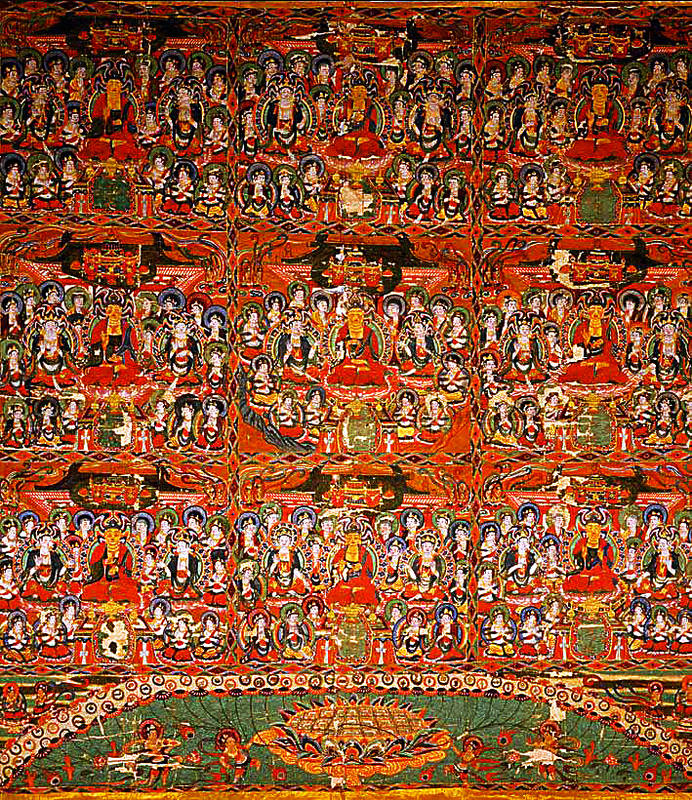 The last incarnation of these titles were conferred merely to act as lip-service to various states considered 敌国 "Hostile States" such as various Tibetan lords (the Tibetan Empire was the nemesis of the Tang) and 绝域之国 states within the spheres of influence- such as Japan, culturally converted to be similar to the Chinese but preferred to be isolated. 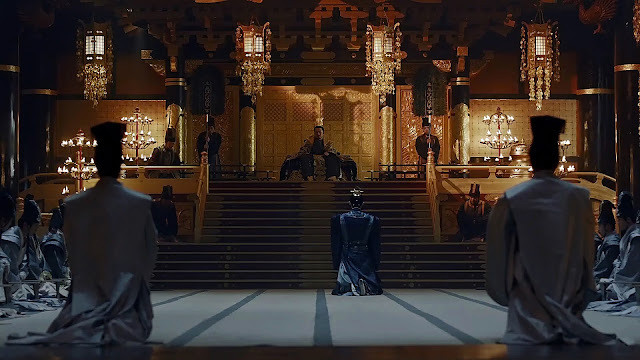 Most of the titles given to those state were mere symbolic gestures and had little actual power or meaning, many simple states 皇帝敬问 "The Emperor's Esteem." The loose-control administrative units, specifically the command area and prefecture, were usually established shortly after a region, state or tribe was subdued and incorporated as a political division within the empire. In this manner, the old local norms would mostly continue as normal, and rather than unilaterally asserting a foreign culture into those regions and thus provoke hostility they could be slowly integrated into the empire through the generations. For most of these remote frontier regions, the local magnates, nobility, religions, and institutions are preserved and function as bubbles of autonomy within a greater empire. A comparative model is the relationship of the Jimi System is Rome's reliance on the various warlords of the British Isles, another's the British Raj and the many native Indian Princely States that ruled autonomously within it. 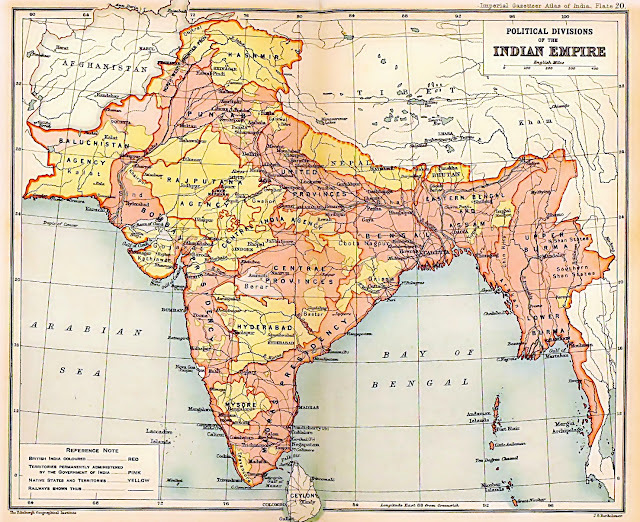 1909 Map of the British Indian Empire, showing British India in two shades of pink and the princely states in yellow. The frontier of the Chinese Empire were usually composed of a patchwork of local governors who were simultaneously the strongmen of their own local polities. 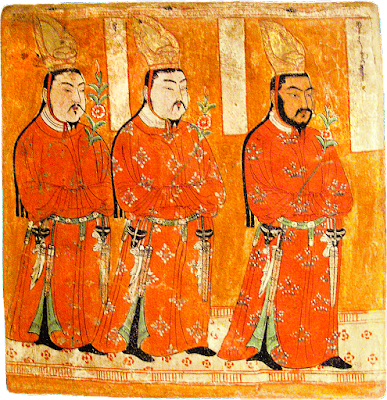 In the post-Ān Lùshān period, approximately 75% of all provincial governors were military men regardless of their titles and designations. Out of these, four of the most powerful military governors rebelled in Hebei. In return for their surrender, they were allowed to remain in command of their armies and to govern large tracts of land as they saw fit. 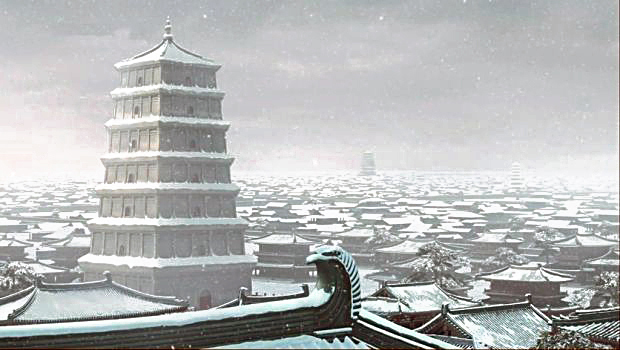 In the year 775, Tian Chengsi of Weibo Jiedushi attacked and absorbed a large portion of Xiangzhou from Zhaoyi Jiedushi, resulting in the "three garrisons of Hebei." Over time, these military-governors were permitted to pass their offices and hereditary holds directly to their children, further cementing their entrenchment into their respective regions. 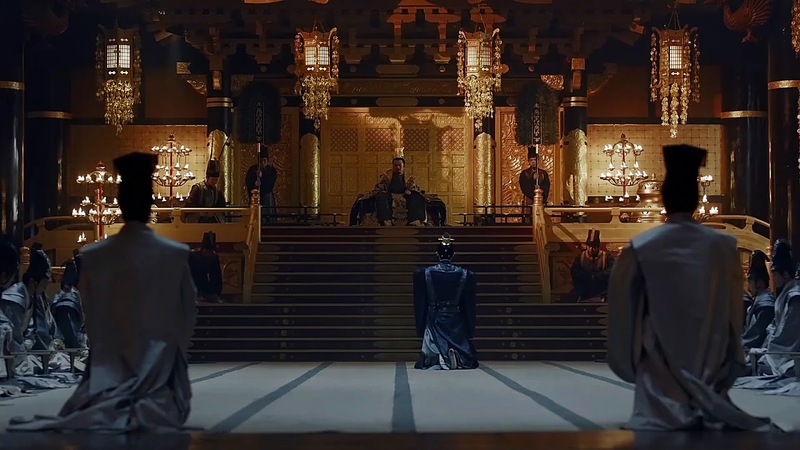 They became essentially feudal lords in all but name, and most merely paid lip-service to the imperial court, leaving the feeble emperors to be mired in corruption while they consolidated powers. 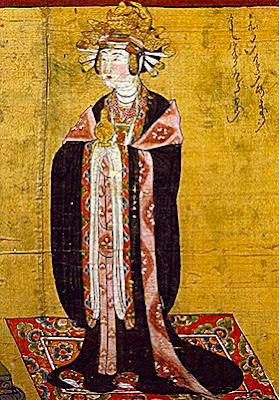 Although nominally subordinate to the Tang by accepting imperial titles, the garrisons governed their territories as independent fiefdoms with all the trappings of feudal society, establishing their own family dynasties through systematic intermarriage, collecting taxes, raising armies, and appointing their own officials. What's more, several of the leading military governors in Hebei were non-Tang citizens. Map of the 10 major Jiedushi and their military strengths during Emperor Xuanzong's reign (as of 745 AD) Powerful jiedushi eventually became fanzhen rulers (de facto warlords) and overrode the power of the central government. 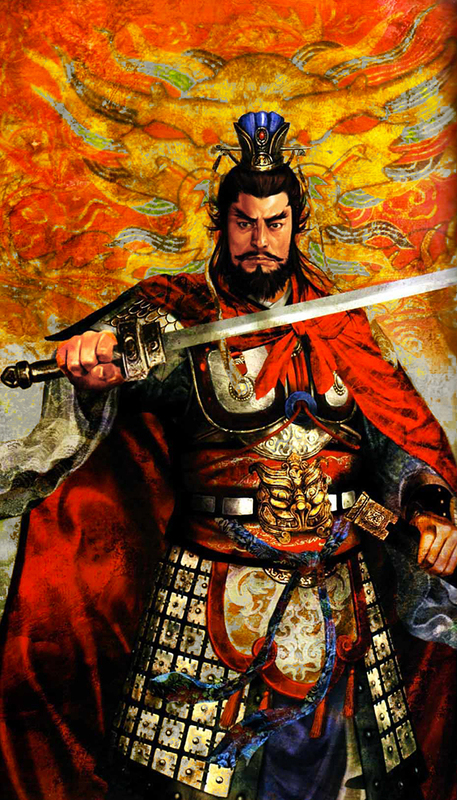 An early example of this was An Lushan, who was appointed jiedushi of three regions, which he used to start the An Lushan Rebellion that abruptly ended the golden age of the Tang dynasty. Even after the difficult suppression of that rebellion, some jiedushi such as the Three Fanzhen of Hebei were allowed to retain their powers due to the weakened state of the court. 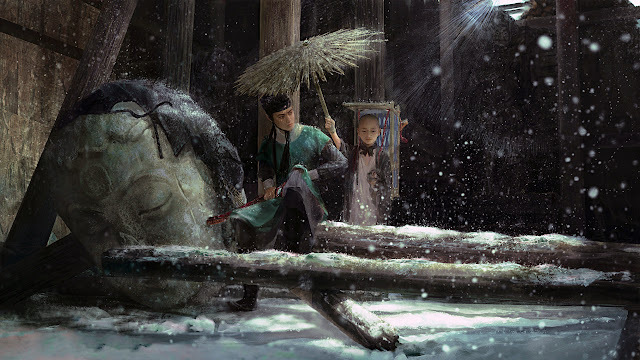 Suddenly, the end of the Tang looked direly similar to the dying throes of the Han and the high warlordom of the Three Kingdoms. And when the Tang dynasty collapsed- the Jiedushi regional warlords all turned on each other and warred for supremacy. The 7 decades of chaos and anarchy that would follow would be known in Chinese history as the Five Dynasties and Ten Kingdoms period. 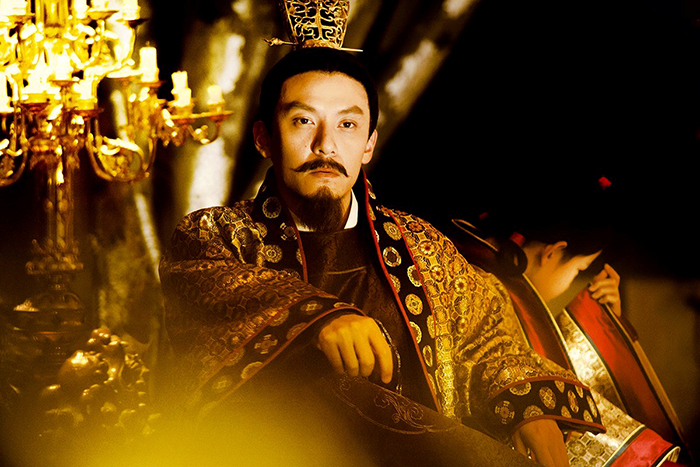 For those former Tang governor-Kings and clients, they were forced to adjust to a new reality. 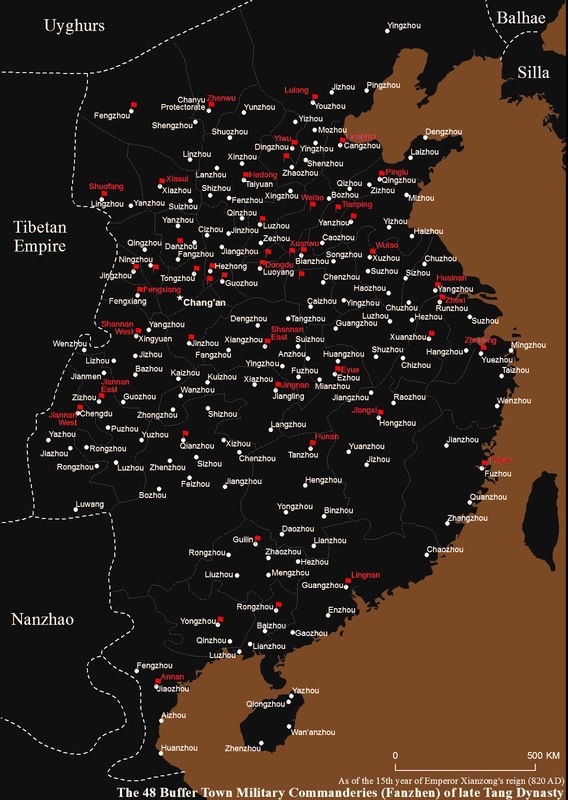 The 48 Fanzhen (Military Districts under Buffer Towns) of late Tang dynasty, as of the 15th year of Emperor Xianzong's reign (820 AD). The Five Dynasties and Ten Kingdoms period was an era of high localized violence and inter state wars. Gun powder, fragmentation grenades, fire lance weapons and primitive rocketry were invented along with many other advancements in the arts and technology. 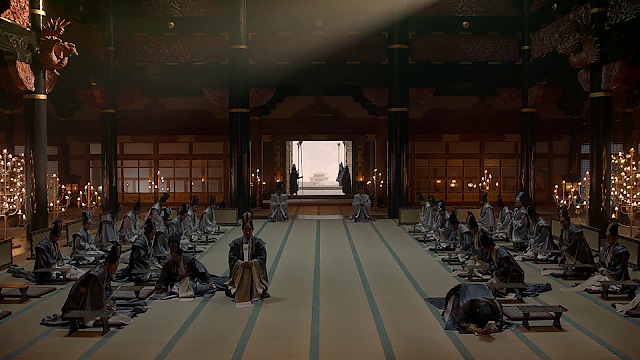 On a political level: for those familiar with Asian history- especially Japanese history, this era could have turned out similar to the Genpei Wars in Japan, where China' could (almost enduringly) be turned into a feudal society ruled by a hereditary military aristocracy. Simply put, because the multi-ethnic empire crumbled at its center, many former native clients on the fringes of the empire simply pledged their allegiance or diplomatically married with the powerful local Chinese governors for mutual protection. In this new reality, both would be autonomous states, but the common fronts of the two new states were secured. 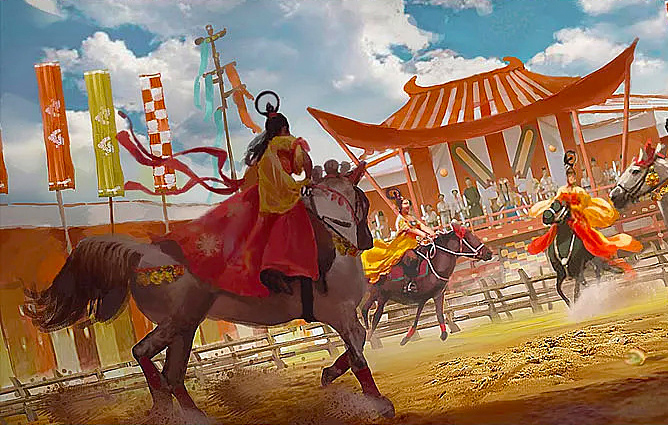 Most of the significant players in the aftermath of the collapse of the Tang dynasty would have been trusted warlords who allied with the Tang that were entrusted with swath of the frontier lands and empowered to handle the local affairs. In this manner, they were similar to the various non-Roman Dux that served as Magister Militum on Rome's fringes before the Western Empire's collapse. 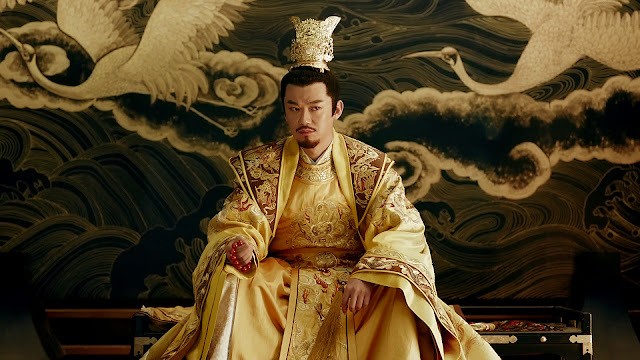 know that he section below is a summary, if you prefer a much more extensive fullcoverage of the vassals and client states after the fall of the Tang dynasty, please read this section here. One of greatest examples of these former client kingdoms that were able to assert a great decree of power and rise to prominence was Western Xia, or Xi Xia. 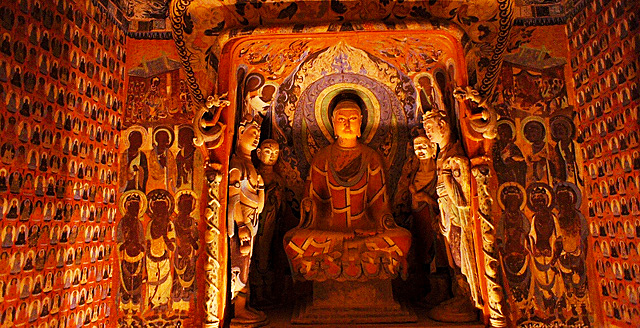 Western Xia was a multi-ethnic state composed of an ethnic Tangut elite that ruled over various denizens of Han Chinese, Tibetan, Uyghur, and Qiang minorities in what is now the arid Gansu Province. 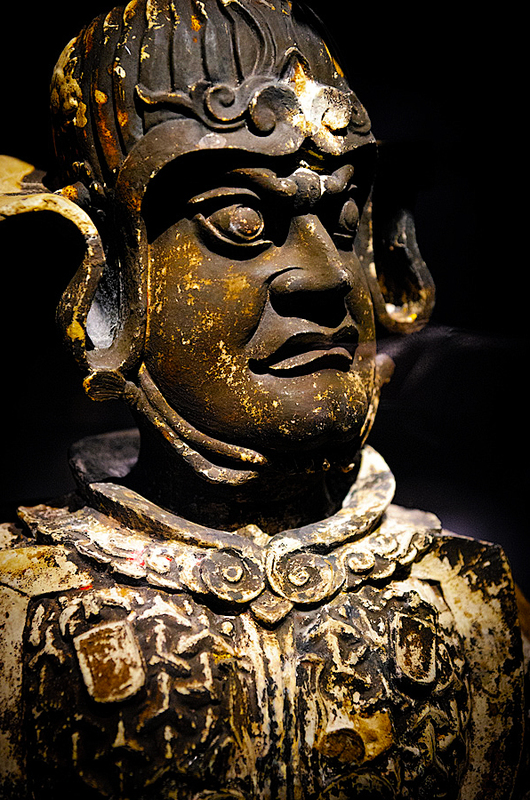 In 881 the Tangut general Li Sigong was granted control of the Dingnan Jiedushi, also known as Xiasui by the Tang emperors, for assisting the Tang in suppressing the Huang Chao Rebellion (874–884)- for their services, their clan was conferred the Tang imperial clan's last name of "Li" which were retroactively applied to all of the clan's ancestors. 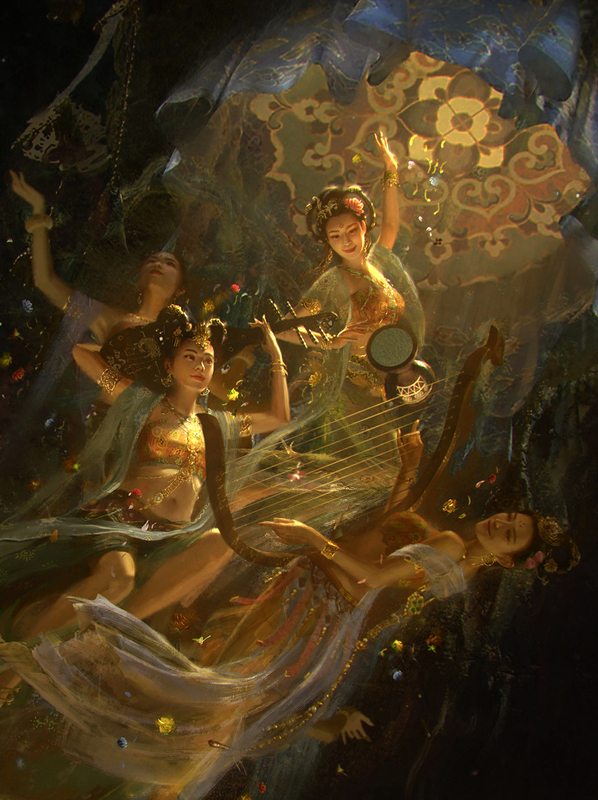 After the fall of Tang in 907, the rulers of Dingnan were granted honorary titles by the Later Liang. 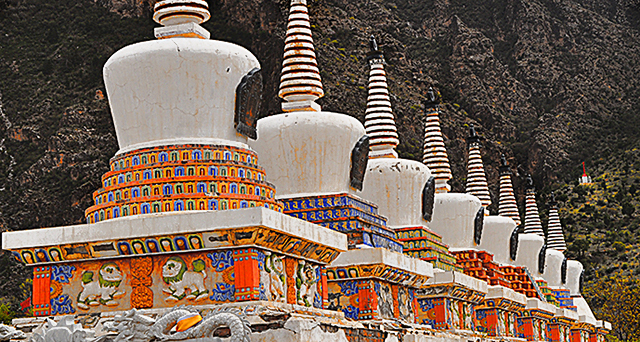 In the ensuing centuries the Emperors of Western Xia would not only brand themselves as the heirs of the Tang. They would field a powerful army with powerful cavalry that warred with foes from every direction. 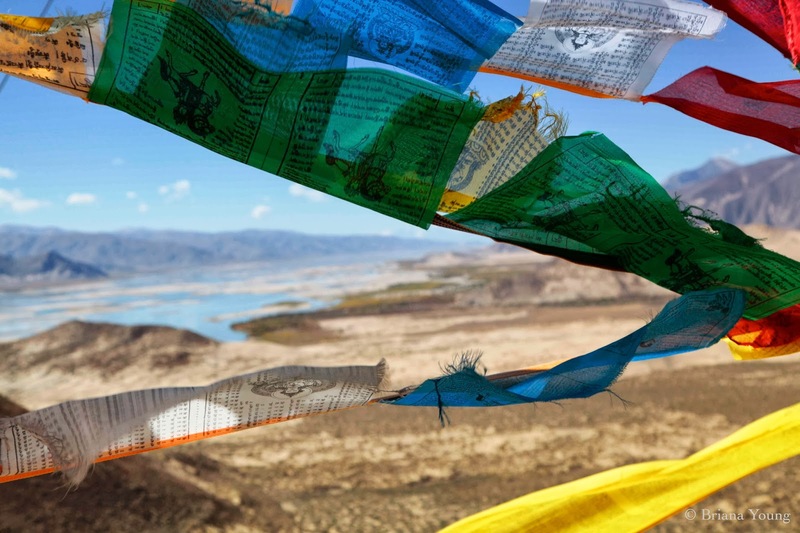 To the west they warred with the Turkic invaders, to the east they faced the Khitan Liao and the Northern Song, to the south they attempted to rebel and conquer the Tibetan warlords, and to the north, they faced the steppe nomads that raced down from the Gobi Desert. They would be an important local power and retain their independence (while pledging their allegiance to the memory of the dead Tang "ancestors") until they were destroyed by the Mongols. 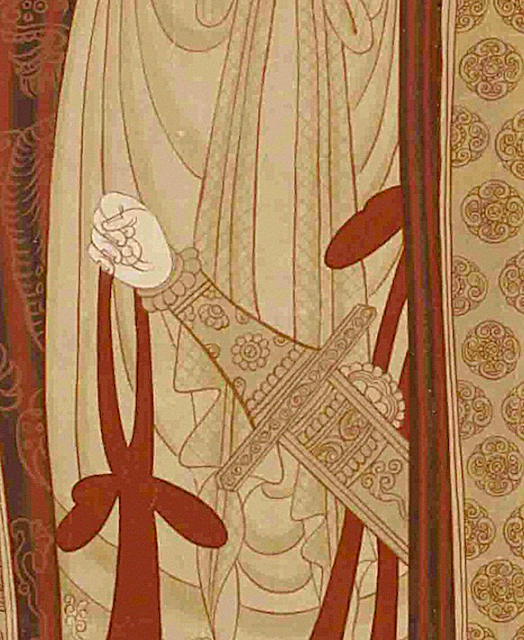 A Khotanese noblewoman. 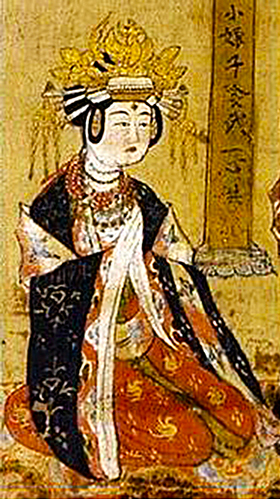 A Khotanese noblewoman. 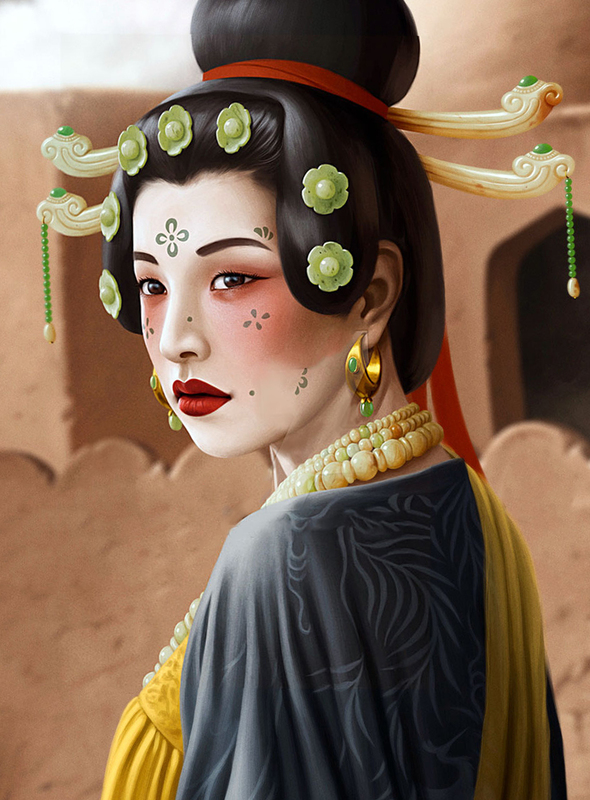 The royalty of the Tarim Basin were known to have worn heavy make up (like the Tang) and lived in palaces that blended Chinese and local architectures. The outer walls were made of rammed earth while the interior were constructed in the square based Chinese Fengshui layout. 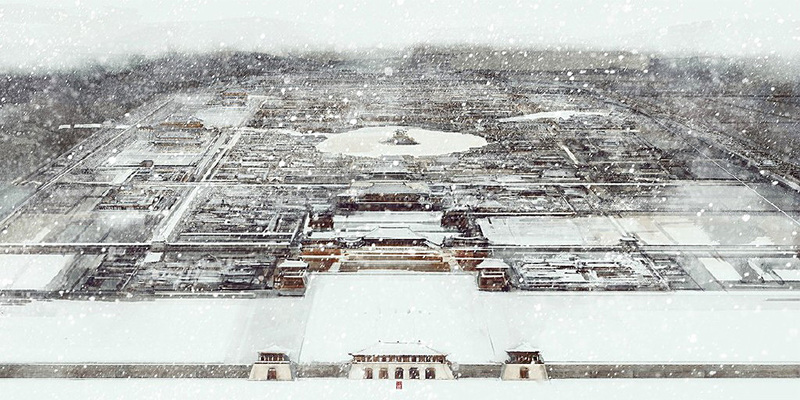 Though the Tang were driven out of the Tarim Basin by the Tibetan Empire in the 8th- and 9th centuries, the various city-state Kingdoms still maintained close relationships with the Tang empire. 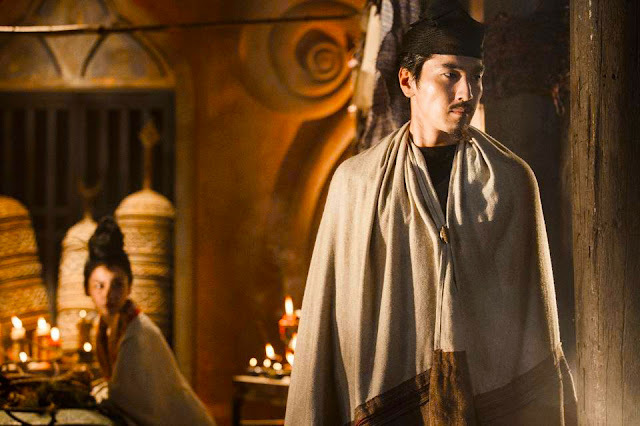 When the Tibetan Empire imploded due to the assassination of its last Emperor, the Tarim states rekindled their former relations with the various Chinese states. 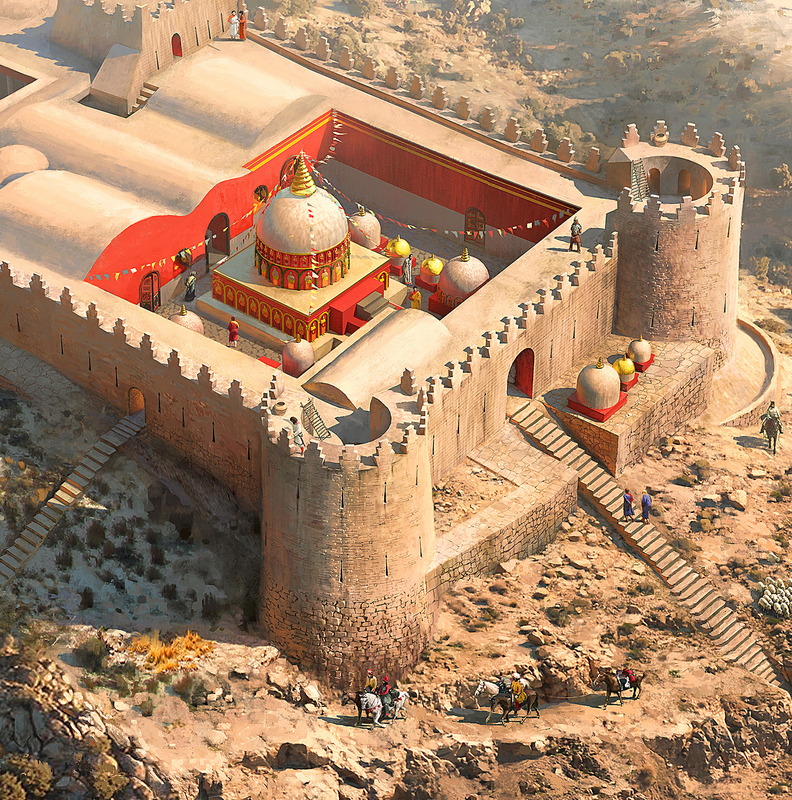 One of the key power was the Saka Kingdom of Khotan. 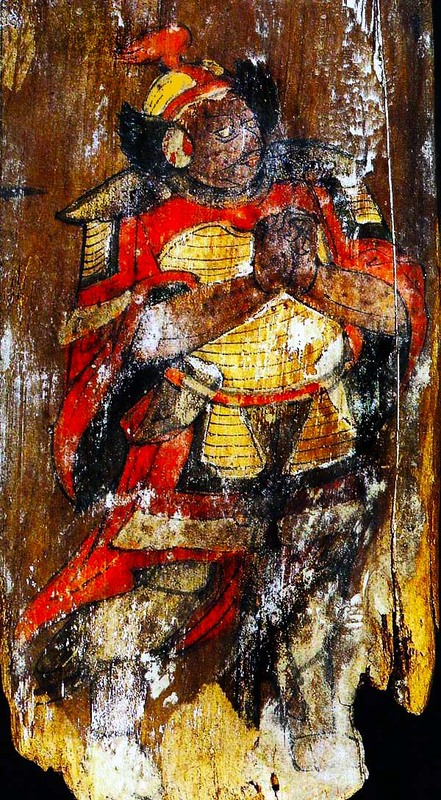 The Khotanese were Indo-Europeans of Saka descent, and throughout the first millennium cultivated close relations with the Han and the Tang empires and for much of its history they were able to continue to rule as local kings within their domains while also served as governors for the imperial court. For their services they- too were granted the imperial clan's last name of Li. 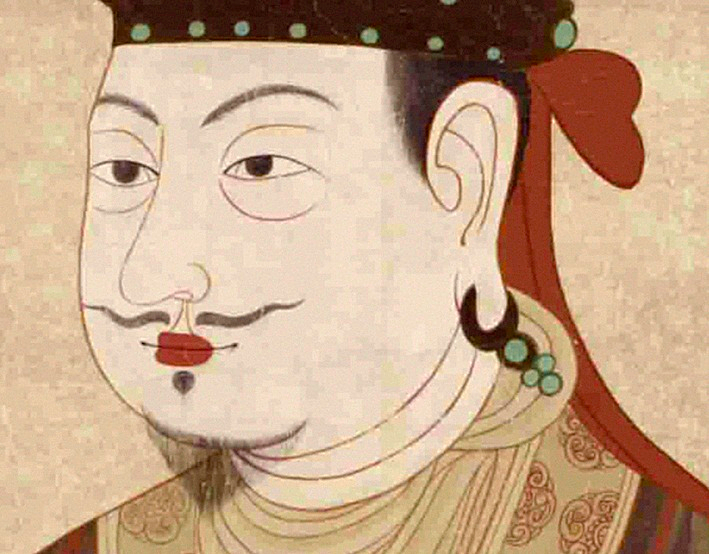 Li Shengtian (simplified Chinese: 李圣天; traditional Chinese: 李聖天; pinyin: Lǐ Shèngtiān; Saka: Viśa' Saṃbhava) (died 966) was the king of the Indo-European kingdom of Khotan from 912 to 966. His era name was Tongqing (同慶, lit. "to celebrate together"). 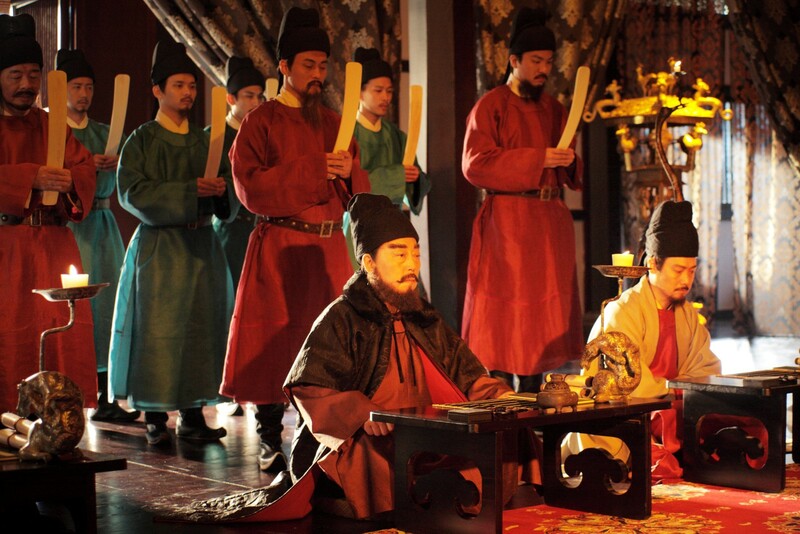 He married the second daughter of Cao Yijin (曹議金), the first governor of the Guiyi Circuit. In another act of marital diplomacy, Cao Yijin's grandson, Cao Yanlu (曹延祿), married Li Shengtian's third daughter. 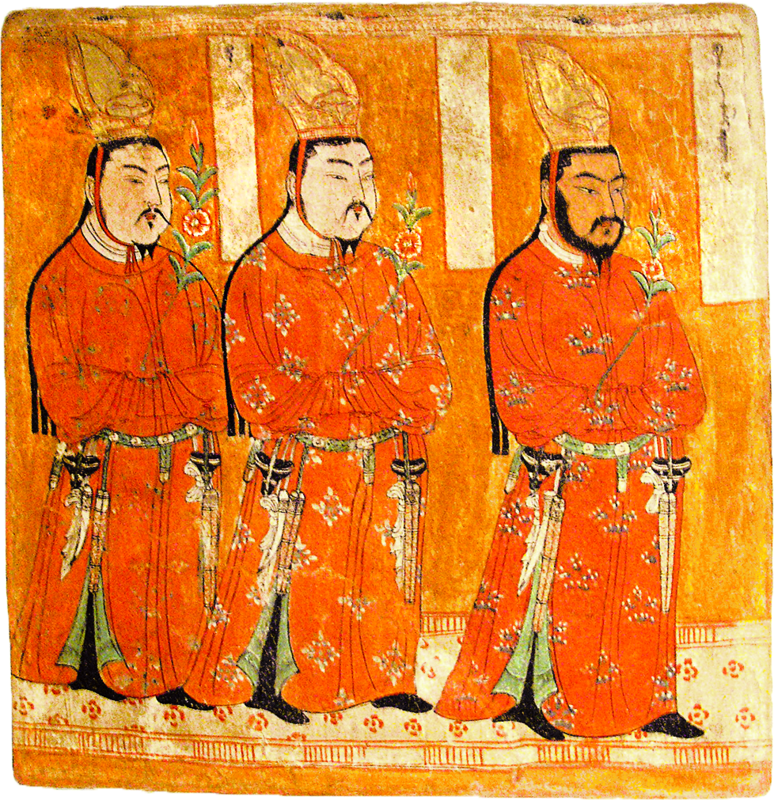 When the Tang dynasty fell, the Khotanese Kings quickly sought out alliances with the powerful military governors of the Tang remnants. The Saka King of Khotan Li Shengtian- Viśa' Saṃbhava in the native Saka tongue married the second daughter of Cao Yijin (曹議金), the first governor of the Guiyi Circuit. In another act of marital diplomacy, Cao Yijin's grandson, Cao Yanlu (曹延祿), married Li Shengtian's third daughter. The Khotanese would continue their diplomatic overtures with all the neighboring Chinese powers including the Song dynasty. Fashion of a late Tang lady, and the fashion of an early Song dynasty lady. 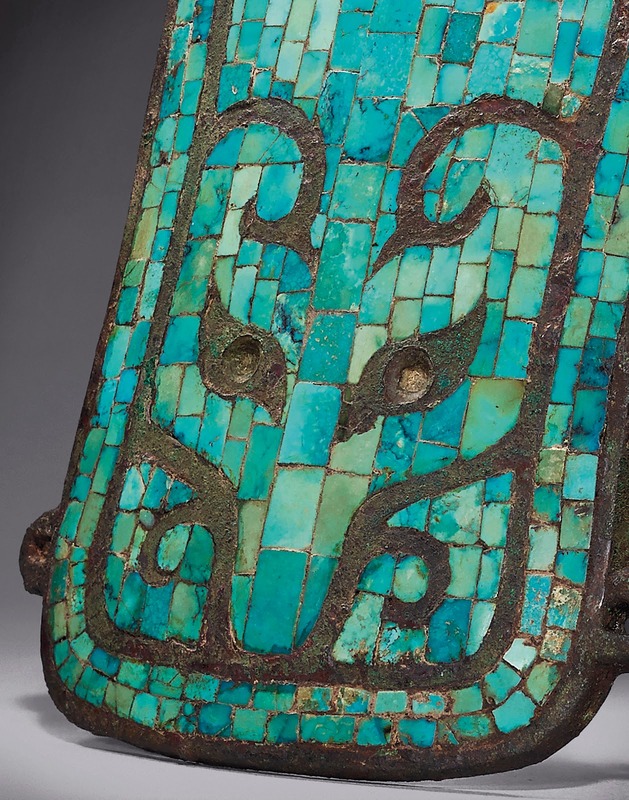 Despite being isolated from the epicenter of Chinese culture, the nobility of Khotan still closely imitated the fashions and norms of the Chinese heartlands. 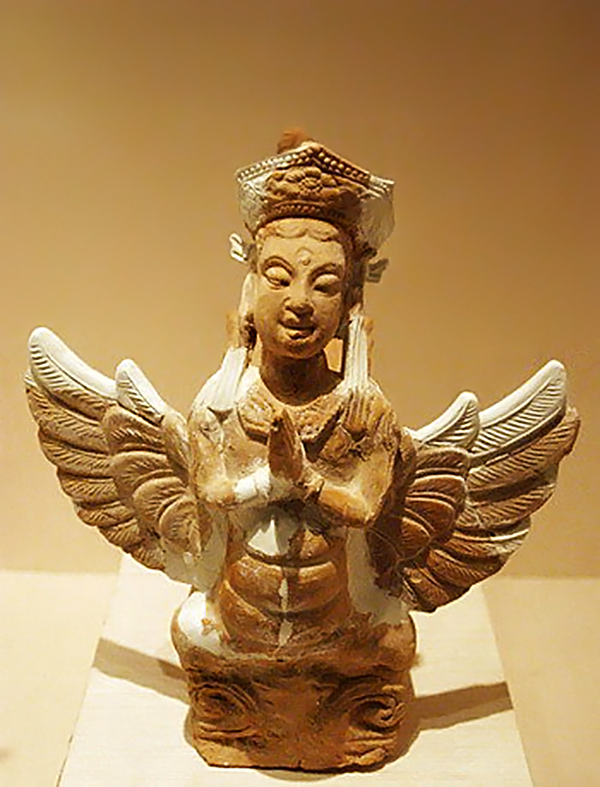 In the 10th century, the Indo-European Saka Buddhist Kingdom of Khotan was the only city-state that was not conquered yet by the Turkic Uyghur (Buddhist) and the Turkic Qarakhanid (Muslim) states. 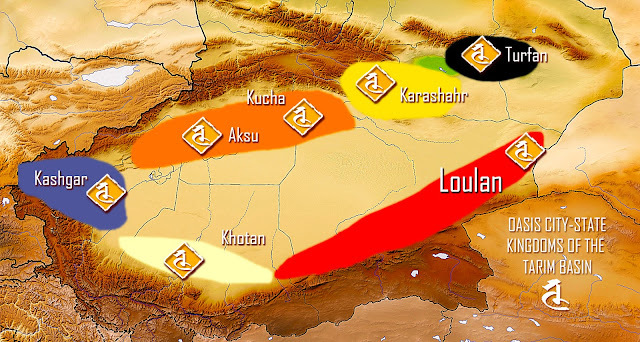 During the latter part of the tenth century, Khotan became engaged in a struggle against the Kara-Khanid Khanate. The Islamic conquests of the Buddhist cities east of Kashgar began with the conversion of the Karakhanid Sultan Satuq Bughra Khan to Islam in 934. 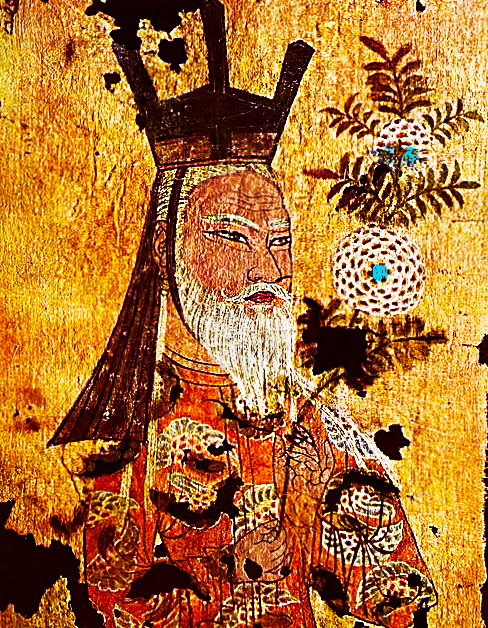 Satuq Bughra Khan and later his son Musa directed endeavors to proselytize Islam among the Turks and engage in military conquests, and a long war ensued between Islamic Kashgar and Buddhist Khotan. Perhaps the most significant players in the great collapse of the Tang were the ethnically Turkic generals hailing from the Shatuo Tribe. 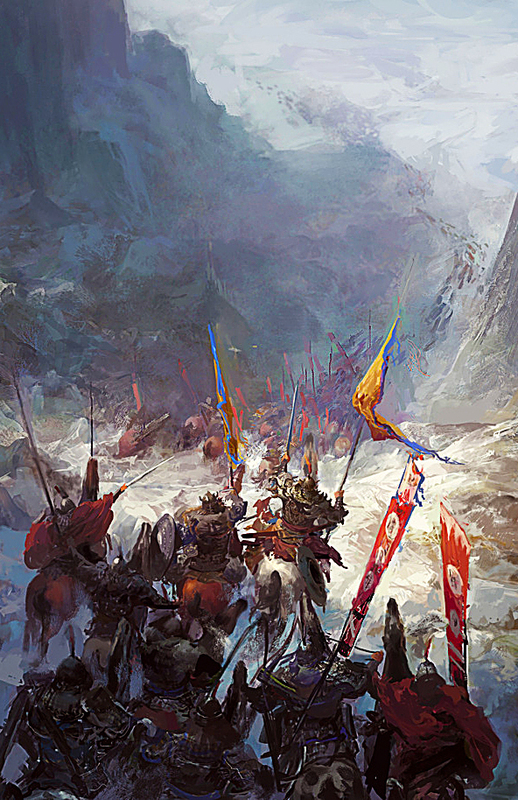 Though initially the tribesmen served as Tang's northern auxiliaries- its best warriors served Tang as Tang's generals. More than the other client kingdoms they not only sought to merely preserve their independence against potential rivals in the collapse of the Tang but actually threw in their lot and attempted to make themselves fully legitimatize Chinese Emperors. 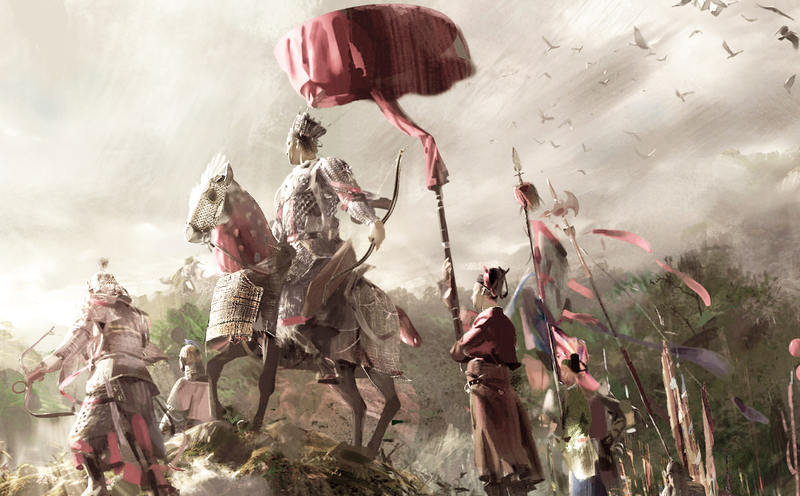 They would lead their own Tang remnant armies and heavily influenced northern Chinese politics from the late ninth century through the tenth century. 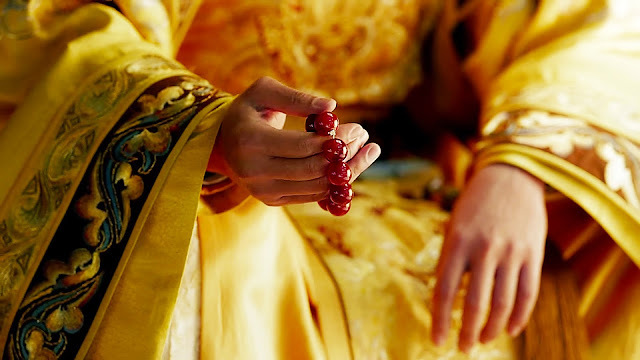 They are noted for founding three of the five dynasties and one of the kingdoms during the Five Dynasties and Ten Kingdoms period. Like the founders of Western Xia, the Shatuo Turks rose to local prominence when they aided the Tang during the empire's last days. Originally part of the Western Gokturk Kaganate as part of On-Ok (Ten Tribes) or Nushibi union occupied territory east of the lake Barkul, and called by the Chinese as Shatuo ("sand masses", i.e. desert), formed of three sub-tribes. Some scholars have identified them as being part of the Oghuz Turks. 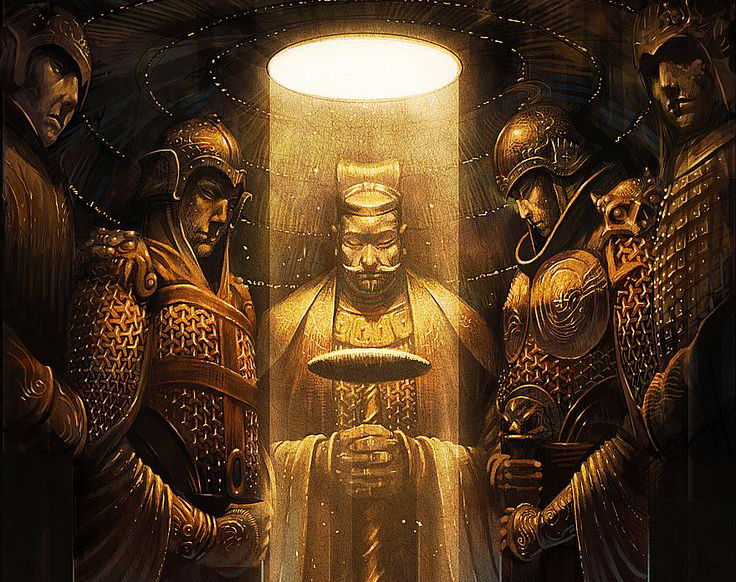 After the defeat of the Gokturks the Shatuo participated in suppressing many uprisings on behalf of China, and for that the Chinese emperors granted their leaders various titles and rewards. 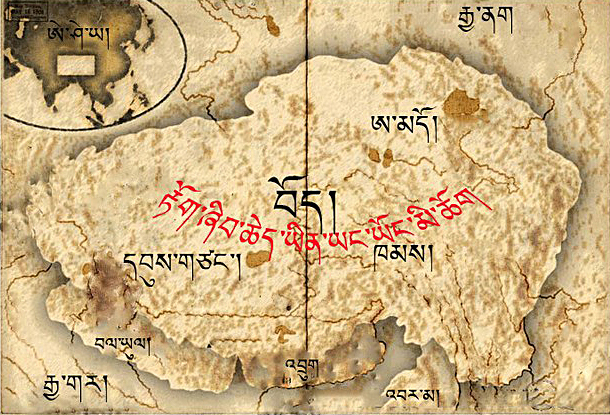 After their lands were smashed by by Tibetans in 808, the Shatuo asked for protection from China, and moved into Inner China. The Shatuo Turks were gradually assimilated, and held onto their power base in Shanxi (central region of modern-day China). 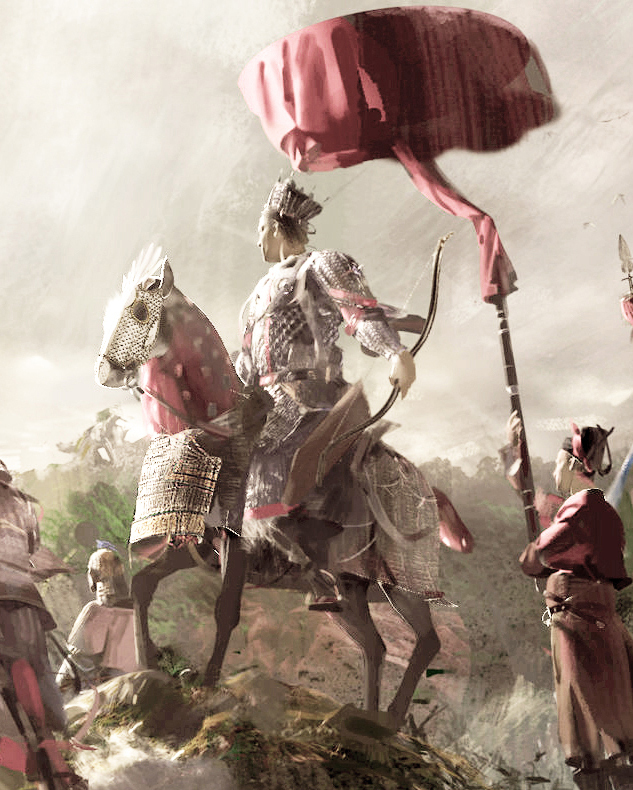 Their tribesmen suffered many losses in suppressing the massive Huang-Chao Rebellion in 875-883. For their services, they were granted more powerful titles. When the Tang fell the Shatuo tribe only counted around 50-100,000 tribesmen while they ruled a Chinese population of about 50 million. They gained in strength through the 910s until finally in 923, they were able to completely overcome the Later Liang with Khitan assistance to found The Later Tang, after the collapse of the Later Tang, the Shatuo founded the Turkic- Chinese dynasties of Later Jin, and after that the mostly Turkic Chinese dynasty of Later Han. THE JIMI SYSTEM: LEGACY AND ANALYSIS. The extensive Jimi system provided a framework as a model for frontier governance, but would serve as an inspiration for the later dynasties to represent how a Chinese polity would conduct itself while having to delegate powers to autonomous vassals. 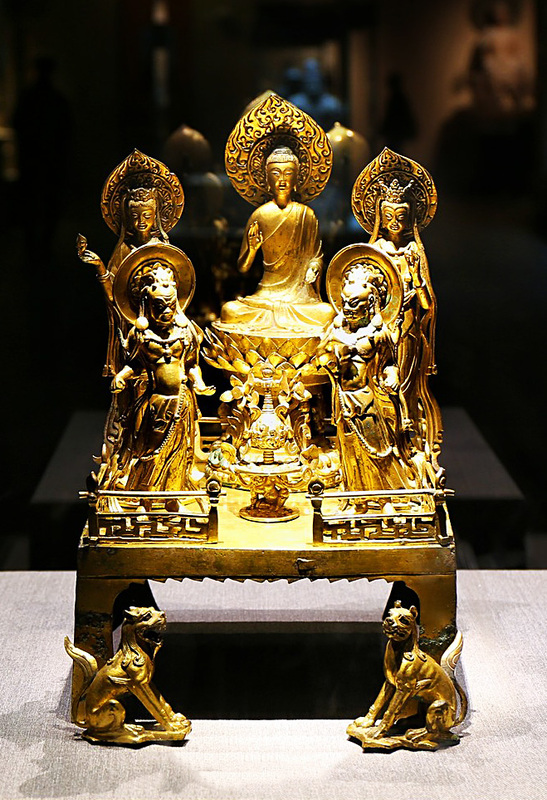 With modifications, it was subsequently used in the Song, the Mongol Yuan, and Ming dynasties under other names such as the Tusi system (土司制) until around 1726, when a new civil order called the Amban was established under the Qing government. 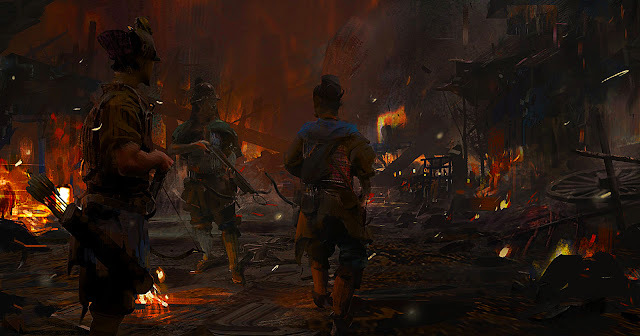 In the next chapter we will cover the special vassal relations of the Yuan and Ming dyansties- especially the various autonomous divisions of the Yuan government and Ming dynasty's special relation with various Tusi Chieftains that were so fierce in temperament and set in their ways that they were better left off as unconquered allies. Stay tuned friends. 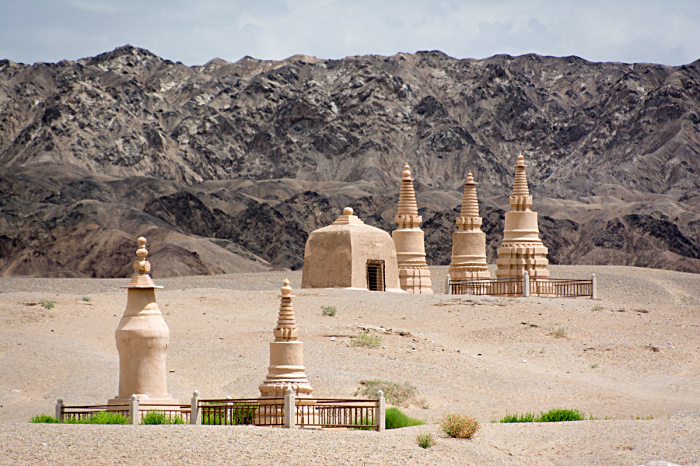 The Kingdom of Khotan were Saka-Tocharians? 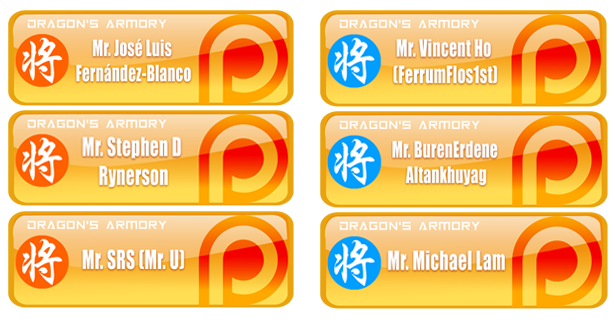 ... AND they received the 李 surname?? 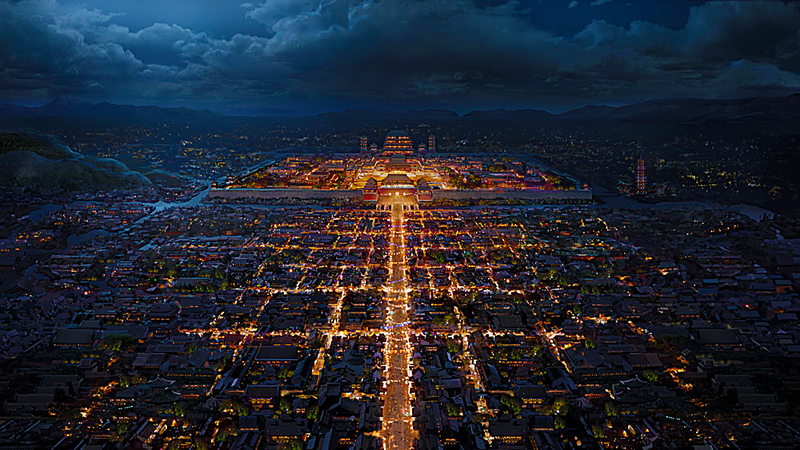 When Tang fell, Khotan was the only city-state that was not conquered yet by the Turkic Uyghur (Buddhist) and then the Turkic Qarakhanid (Muslim) states. 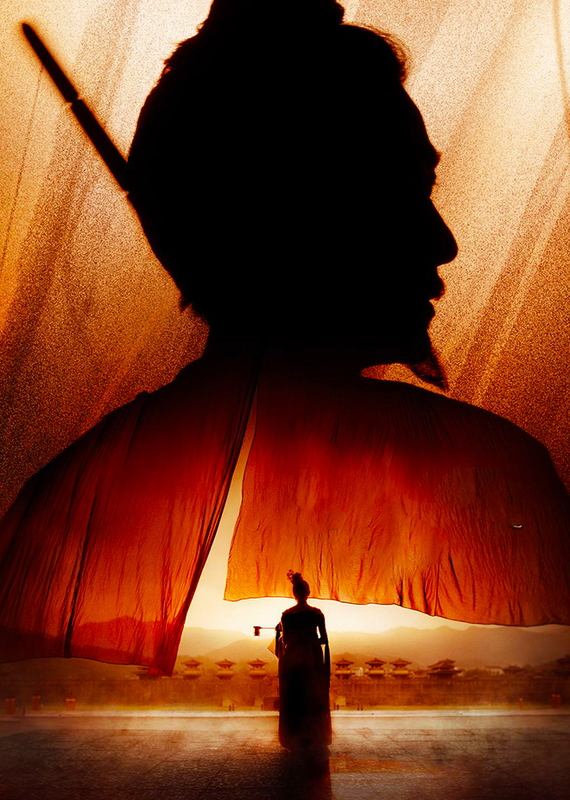 For protection they formed a close series of marriages with the nearby Guiyi Circuit (or Dunhuang) - a Tang Buddhist successor state to act as a counterweight against the Uyghur Princes. Again, all of that is covered in my new article.